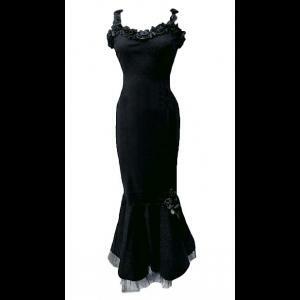 An exquisite long black gothic dress made from slightly stretchy cotton poplin. 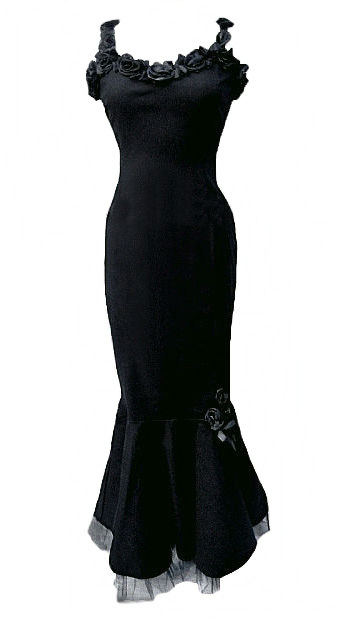 The dress is cut in such a way as to accentuate your figure to give an hourglass look. The sweetheart neckline is trimmed front and back with shimmery black organza roses and these roses also decorate the shoulder straps. The dress nips in at the waist and narrows at about mid-calf after which it flares out in true dramatic mermaid style and is trimmed on one side with more organza roses. The fishtail has a net underlayer which extends below the hem and a long back zip fastening. 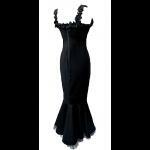 This gorgeous dress would be perfect teamed with long gloves and a dramatic choker. 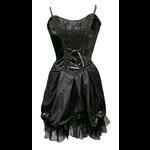 Ideal for the gothic bride. Bust: 32" Waist: 26" Hips: 34" Length: 60"
Bust: 34" Waist: 28" Hips: 36" Length: 60"
Bust: 36" Waist: 30" Hips: 38" Length: 60"
Bust: 38" Waist: 32" Hips: 40" Length: 60"
Bust: 40" Waist: 34" Hips: 42" Length: 60"